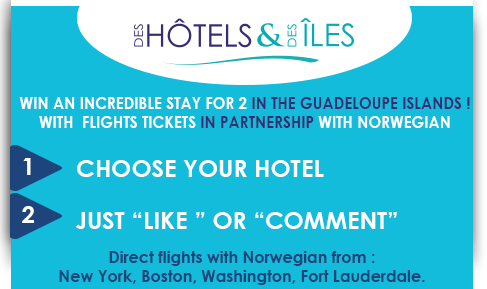 Win a stay on GUADELOUPE in a hotel INCLUDING plane tickets from New York (JFK), Baltimore/Washington, Boston and Fort Lauderdale/Miami flying with our partner Norwegian for 2 persons. This contest will run from the 7th October 2016 to the 7th November 2016 2:00 PM (GMT+1). To participate in the contest, the participant just have to like or/and comment the post dedicated to the sweepstake on the Facebook "Hotel & French Caribbean Islands" page between the 7th October 2016 to the 7th November 2016 2:00 PM (GMT+1). The participants can only enter once with the comments. 1- 2 return flight tickets departing from New York (JFK) or Baltimore/Washington or Boston or Fort Lauderdale/Miami to Pointe-à-Pitre (Guadeloupe) in economy class with NORWEGIAN airlines. From 10th November 2016, last return date 31th March 2017, subject to availability in the dedicated reservation class at the moment of the reservation. The tickets cannot under any circumstances be resold, cashed and are not transferable. . Des Hôtels et Des Iles cannot be held responsible in the event of cancellation by the beneficiary. Transfers airport/hotel/airport are excluded. * : Final date of validity: From 10th November 2016, last return date 31th March 2017 - excluding tourist tax - excluding french school holidays, excluding airport/hotel/airport transfers.